People complain about not having enough opportunities to advance themselves. Generally what they mean by that is the quality of education in the public school systems, or the perceived nepotism and racism in the corporate world. And yes, these situations may cause people to lose hope in their ability to climb the social and economic ladders as high as they would like to. But imagine living in a place where your neighbors explain electricity and other phenomena that they don’t understand by saying that it’s magic or demons. Where your father has to pull you out of school before you reach your teens. because he simply doesn’t have the few dollars for tuition. Where instead of watching your pet dog starve to death you have to put him down yourself. This is the country of Malawi, and this is where The Boy Who Harnessed the Wind takes place. William Kamkwambe grew up here during some of the worst draughts and famines that the country has seen. This isn't the story of a hard-luck kid growing up in the projects who ends up lifting himself out of that situation. It isn't that William didn’t have enough to eat because his father didn’t want to work or his mother spent it on liquor. William didn't have more than a few mouthfuls of food a day because there literally was no food to be had in the country. Years of devastating droughts and corruption coupled with bad management from the top down left Williams family, as well as his neighbors with no fertilizer to grow even subsistence crops. And when their is no food, it doesn't matter how much money you have, because there’s nothing to buy. He spent years watching people simply lay down on the side of the road, on the way to town to try to beg, and not get up again. He watched people try to make a gruel from grounded grasses, dirt and water, and watched as the mud solidified in their stomachs killing them even faster. But William and his family did their best. As long as there were still birds in the skies, William and his friends did their best to snare them and try to bring something home to eat. Any time it looked like they might get enough rain to put crops in the ground, they made sure to try, and with the first successful crop, they were finally able to eat until they were actually full again. The very best bit of luck that William received was that his family is, if not properly educated by Western standards, then at least not so backwards as to explain away the workings of the universe as “magic.” William always valued his schooling, and of the biggest disappointments he faced at the beginning of the drought is when his father wasn’t able to give him the money for tuition to the school he had been going to. For other, less determined boys this would mean the end of their education. But he was lucky enough to live in a village with a library. While he wasn’t really able to keep up with all his classmates on his own, he was at least able to find out about the things that interested him, and apply them to his own life. One of those situations that he always lamented was that once it gets dark out, the day is done. Without electricity to the house, a dozen hours is wasted each night. William has seen bicycles with lights on the front that are powered by the person pedaling the bicycle. He’s taken apart enough radios and basic electronics work, but the matter of how to keep the generator turning eludes him. 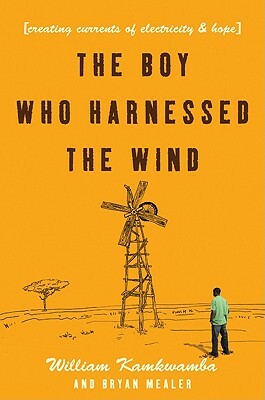 Until one day, reading at the library, he sees a picture of a windmill. Suddenly, the curse of darkness might be at an end. With enough electricity, perhaps he could even work a stronger pump at the well to bring up enough water to irrigate the family’s crops. It’s amazing how much the technology that so many take for granted can mean so much to others. Even after William figures out the difference between AC and DC, he still nearly burns his house down using scavenged bits of wire to bring a light into his bedroom. That’s the determination that William continues to put forward. And he has the ability to live in any country he wants now. But after his schooling is over, he wants to return to Malawi to help bring his country up, and introduce technology and more schools to the country in which he was raised. And thats something great. Highs: His trip to the TED conference, and his reaction to the Vegas casinos.